Depending on the type of features that are offered, cheques are available for purchase at various price points. Laser printing, special security elements or the number of cheques needed will have a bearing on the cost. In addition, if you require special custom-work like an exclusive cheque design, it will add to the price. Did you know that numerous security features can be added to cheques to keep your account protected? It’s true. However, even with manufacturers efforts to remain ahead of the curve, scammers are right there behind them copying the latest security features. This is why cheque companies utilize the most-up-to-date technology in order to ensure the cheques they produce are on the cutting edge. An important safety feature for laser printed cheques is a hologram. The hologram, like on currency, is a reflective image fused to each cheque. If a fraudster wishes to scan or photocopy the hologram, it will appear non-shiny. Another option is Chemical protection. These types of cheques have chemical indicators in the paper that appear as stains if ink solvent is applied. Another consideration to ask yourself when purchasing cheques is what are their use? If a company is paying a large number of invoices, a two-part cheque with columns listing the itemized invoices, reference number, date, gross and net amounts is the best option. If the company pays one invoice at a time, a two-part cheque with the company name will work. For some small businesses, a one-part cheque is adequate. Another factor will be the number of signatories. Some small businesses and most non- profit organizations will utilize cheques with two signatories. Today’s business systems are computerized so when purchasing cheques it is important that they be compatible with the companies’ financial system. Today’s cheques are supported by accounting systems like Simply Accounting, QuickBooks, Quicken, and Sage ERP Accpac. These are the most common but there are hundreds more. Cheque companies can accommodate just about any computerized accounting software. 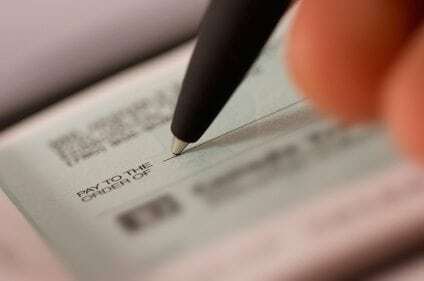 Cheque companies usually produce all the ancillary forms pertaining to a business. The cheque design will match the invoices, statements, and purchase orders. This helps businesses manage their bookkeeping while presenting a professional image. Remember, however that all forms need to be compatible with the businesses ‘software and available in single and multi-part formats. The appearance of the cheque is another important consideration. Cheques can be ordered with a company logo, and other designs. Depending on the type of business, cheques can be very formal with minimal colours and designs. For example, if the business is a pet supply company, little puppies and kittens embossed on the cheque are probably acceptable, but if the business is a financial management company, something as whimsical is not a good choice. Today’s requirements for both security and a solid image makes ordering cheques a very important part of today’s business. So when ordering cheques keep in mind these 6 factors in mind.